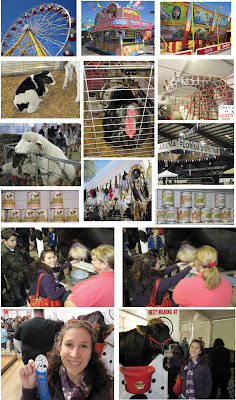 This week I am inspired by a trip to the State Fair we took a couple of weekends ago. The fair is a funny place; it’s a bit of an oxymoron. When we first walked in we were directed by the follow of traffic to walk towards the rides and carnival games. This area is a little scary and yet some how pretty at the same time. The rides to begin with, are scary, not just because you go fast and upside down and tossed all over the place but because these rides are considered “safe” and yet are setup in a couple hours after riding into town. Scary! But at the same time I can’t help but enjoy walking around relishing in all the bright colors and awesome illustrations on the rides, games, and stagecoaches. I have to admit the reason for us going to the State Fair is because for the longest time one of my must dos on my bucket list included milking a cow. I know its weird, right. I don’t know why, its just one of those things I felt I had to do. For years, I have been searching for ways to milk a cow. So I figured, since I don’t have any friends who have a farm or own a cow the only way I could possibly accomplish this goal is by attending the state fair in hopes of milking a cow. So much to my excitement when I saw the sign, cow milking every other hour I was ecstatic. If you know me, you know I was the first in line and even though several little kids managed to get in front of me I was still the first to milk the cow. I got a little blue ribbon and everything. I wore my ribbon and sticker with pride that day. So since this was such a monumental accomplishment in my life (I know I am weird), I thought I had to dedicate a line of stationery to it. Check back at the end of the week to see the new stationery line I come up with. For now, enjoy some of the photos from this fun Saturday afternoon.